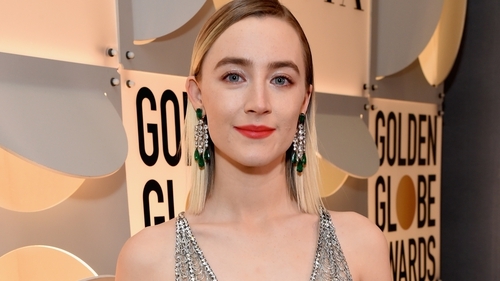 Saoirse Ronan landed the cover of Vanity Fair's 25th 'Hollywood Issue' and she absolutely nailed it. The actress posed for the cover alongside Hollywood stars including Rami Malek, Chadwick Boseman, Timothée Chalamet, Yalitza Aparicio, Regina King, Tessa Thompson, Nicholas Hoult and many more. According to the magazine, each performer was chosen due to their unique Hollywood story that says "much about where the business has been—and where it is going". Three-time Academy Award-winning cinematographer Emmanuel "Chivo" Lubezki created the cover image as well as accompanying portfolio shots of each of the subjects which he shot on a camera that captured them in "diamond-sharp motion". Styled by Executive Fashion Director Samira Nasr, Saoirse wore two incredible dresses for the shoot. A sparkling silver number that can be seen on the front cover and a breath-taking pink dress that looks like it was pulled straight from a fairytale. In her interview with the magazine, Saoirse said that she hopes to see Hollywood return to the days of shooting on film: "I hope that in the next 25 years of filmmaking cinema doesn’t end up completely disappearing and exist just on a laptop screen. I’d love it if we all went back to shooting film."